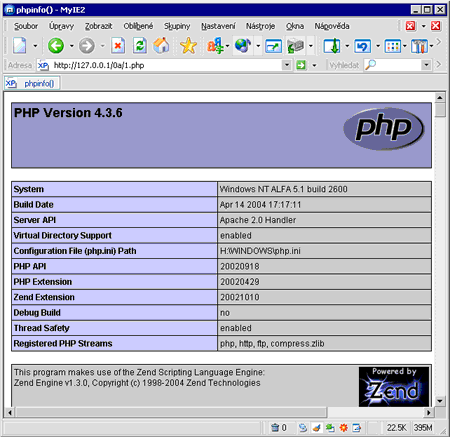 The current php version is 4.3.6 (May 2004). In order to run PHP you have to have installed or install Windows2000/XP and Internet information Services (If the IIS is not installed yet, use Add or remove programs - Add /Remove Windows Components. a. CGI (Common Gateway Interface) (php.exe) - Its disadvantage is that every instance is run in its own memory space. If there are more users, there are several web application instances in the memory which results in huge performance decrease. CGI interpret is not compiled - the HTML code is created through interpret. b. ISAPI modules (Internet Server Application Program Interface) (php4isapi.dll) - ISAPI modules provide higher performance than CGI. The dll library (ISAPI module) is run as a part of the Internet server. In older PHP versions using of ISAPi instead of CGI was connected with many problems with possible instability and various errors. Newer PHP versions should restrict these errors, provide higher performance and many new features. If there appear some problems with stability, try to run the application on a server configured with CGI. It is now, besides the Apache web server, also supported for Microsoft Internet Information Server (IIS). ISAPI library is compiled - creates HTML code without the need of using interpret. It enables to install a light version of CGI. It brings some restrictions and lower security. It is not often recommended, but for quick installation on a testing computer, in local network or within Intranet it can be used. After you run the installer, you can choose from standard and advanced installation that allows to change some standard settings. After you finish the installation, the php.ini is changed, copied into Windows directory and then the web file is configured for using php webs. In Windows XP, upon the standard installation, you just choose the target directory for files (c:\php), setup SMTP and define the server type. Unfortunately, the configuration of IIS will not be run automatically and following error message appears: "Due to a missing OCX control on your system the installation Wizard is unable to configure your server. However, PHP has been successfully installed, and you need to do now is manually configure the web server as described in the install txt file which can be found in your php installation directory." For full functionality of PHP you have to set up mapping (3.a below). b. Manual - Here you can exactly define both CGI and ISAPI. Manual configuration of parameters allows to set up a little more complex settings and to configure all php features without any restriction. 1. After you download it from Internet, extract the files into a directory (e. g. C:\php4). Using PHP for testing under Windows is often used. If you want to use PHP on an Internet server, it is recommended that you use the Unix/Linux operating system on an Apache Internet server.